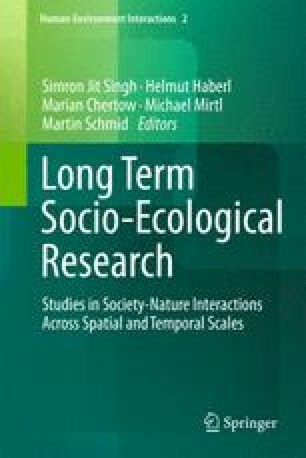 One challenge in the implementation of Long-Term Socio-Ecological Research (LTSER) is the consideration of relevant spatial and temporal scales. Mismatches between the scale(s) on which biodiversity is monitored and analysed, the scale(s) on which biodiversity is managed, and the scale(s) on which conservation policies are implemented have been identified as major obstacles towards halting or reducing biodiversity loss. Based on a meta-analysis of 18 biodiversity studies and a literature review, we discuss here a set of methods suitable to bridge the various scales of socio-ecological systems. For LTSER, multifunctionality of landscapes provides an inevitable link between natural and social sciences. Upscaling approaches from small-scale domains of classical long-term biodiversity research to the broad landscape scale include landscape metrics and spatial modelling. Multidisciplinary, integrated models are tools not only for linking disciplines but also for bridging scales. Models that are capable of analysing societal impacts on landscapes are particularly suitable for interdisciplinary biodiversity research. The involvement of stakeholders should be an integral part of these methods in order to minimise conflicts over local and regional management interventions implementing broad-scale policies. Participatory approaches allow the linkages between the specific scale domains of biodiversity, its management and policies. The paper was developed within ALTER-Net, a Network of Excellence funded by the EU within its 6th Framework Programme. Apart from the authors, Rehema White, Erik Framstad, Vegar Bakkestuen, Andreas Richter, Clemens Grünbühel, and Norbert Sauberer, also participated in the project. We wish to thank Anke Fischer, Frederic Archeaux and Frank Wätzold for their valuable comments to an earlier draft of the manuscript. This research contributes to the Global Land Project (www.globallandproject.org).